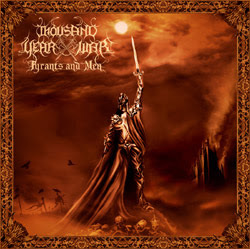 Tyrants & Men, Thousand Year War's first LP, is an album that will inevitably create a conflict between you mind and your heart. Your mind won’t take more than half a listen to analyze this one. Tyrants & Men is a very typical Viking Death Metal record, and you’ll immediately think of a bunch of Swedish Death Metal bands like Amon Amarth. And I think Hiral Lohr -the guitarist/vocalist/composer- is totally okay with that. Then of course, your mind will tell you to forget about that generic and useless record and to go find something new to listen to. Coz' “Who the hell needs another Viking Death Metal album?” right? And that’s where your heart will intervene. Your mind might tell you not to, but you’ll want to listen to this album, simply because it is VERY good and VERY pleasing to listen to. In fact, Tyrants and Men sounds exactly like a homage done by a fan and for the fans. It has all the clichés and all the elements of a record composed by one guy that is totally in love with one specific type of metal. All the songs kind of sound the same, with big catchy headbanging riffs and killer grooves. You also have those warrior and epic melodies that will drag you onto the battlefield. 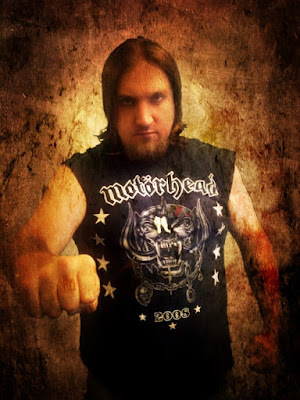 Don't forget to grab the armor and the helmet, just like the epic guy on the cover of the cool digipack released by Abyss records. No wonder Hiram caught a lot of attention after releasing his first EP, called “Shadow Of The Colosus” (available for download right here). The man came up with some awesome tunes! I personally love the songs 'No Gods, No Masters" and "The Storm I Ride" (yep, the song names are unbelievably cliché as well). Hiram Lohr, the man behind Thousand Year War, hails from... Alaska! As a conclusion, I can tell you that between my mind and my heart, I have definetly chosen to trust my heart. When it comes to music, you don’t want to constantly analyze everything and rationalize what you’re listening to. All you need to do is to play records that give you pleasure. And believe me, if you like Epic and Melodic Death Metal, then do what it takes to check out Thousand Year War, because Tyrants & Men happens to be a VERY pleasant release. That’s a nice [3.5/5] !